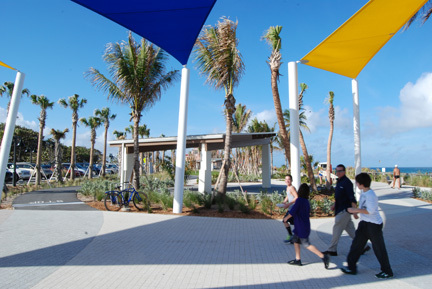 The Lake Worth Beach project is nearly complete, with the grand opening scheduled for March 1st at 7 pm. Many seem to agree the Beach landscape is a vast improvement over the old beach and residents and visitors alike have flocked to the site even while it has been in construction. While many of the sustainable design elements of the project have been removed or altered from the original Singer Studio design, we are hopeful that one day the solar panels, rainwater harvesting, vertical-axis wind turbines and additional shade elements will be implemented.